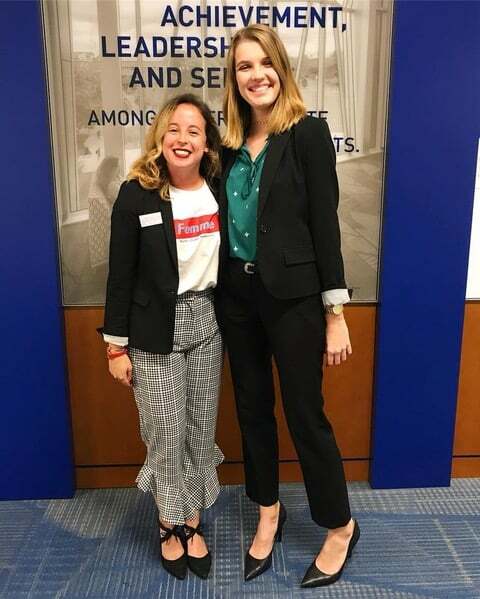 Mads (left) and Katie (right) are both Information Systems students at the University of Florida. After seeing the importance of women in tech at their first hackathon, they realized the need for more women-in-tech role models. They created The Cheddar Tech podcast as a platform to empower women in the technology space and discuss topics such as tech news, women in the industry, equal pay, and more. The Cheddar is available on Apple Podcasts, Anchor, Pocket Casts, Overcast, and RadioPublic. Why did you seek out a career in the tech field? Katie — I sought out a career in this field after much self discovery. While I originally started as Management Business major, I eventually switched to Marketing because I fell in love with data mining and determining why people purchased products the way they do. Little did I know, I was actually in love with the technology behind data mining. This lead me to change my major to Information Systems because the root of what I want to accomplish is using technology to better the daily lives of people. From here, I sought out internships in the Cyber Security and Supply Chain fields to learn as much as I can about the industry. Mads — I sought out a career in technology after I made a great friend and mentor at my university. I was a finance major, as I wanted a more technical role that would eventually lead me to the more strategic side. And I was miserable. Little did I know all of the opportunities available in Information Systems. Being an up-and-coming program, the stigma of IT and help desk support lingered and deterred many interested students. My mentor reassured me of the growing opportunity in the field and the advancement of technology in our lives. Now I have friends preparing for a career in finance while getting a degree in Information Systems due to the high technical skills in demand. I’m so happy I found this field with the help of my friends and now strive to empower women to pursue careers in tech. What is a book that helped you? Katie — I firmly believe in reading and using Amazon’s GoodReads app to track the books I have read and want to read. A book that has significantly helped me on my entrepreneurial journey is Elon Musk: Tesla, SpaceX, and the Quest for a Fantastic Future by Ashlee Vance. This book not only provided so much insight as to how SIlicon Valley operates but also motivated me to pursue my tech dreams at all costs similar to how Musk follow his. Mads — I can also attest GoodReads! My favorite book is one that has helped foster the fire of the “wild woman” within me. Women Who Run With the Wolves by Clarissa Pinkola. I love the novel because it combines storytelling with rich history and spirituality. As someone who is going into an intimidating field, (not only because of its evolving nature but also is stereotypically “bro culture”) I want to embrace my personality while still being an important member of the team. This book helped me channel my motivations and take the lessons learned from women before me to impact all areas of my life, dropping the shame or uncertainty that may come from being a minority in your field. How do you keep updated in the industry? Katie — I keep updated on the industry by reading a variety of news sources such as LinkedIn news and an email subscription known as The Morning Brew. I primarily turn to these since they stick to business news and summarize everything that is happening the day before or in real time, respectively. Reading these allow me to participate in conversations with my peers and become knowledgeable on potential interview topics. Do you have any advice/tips for internships? Katie — Advice and tips I have for internships are to learn as much as you can, find a mentor (it doesn’t have to be the one assigned to you), try to find ways to alleviate tasks from your supervisors, and maintain contacts once you return back to school. These could turn into valuable relationships you’ll be glad you kept when you graduate and begin to look for full time employment. Mads — Make sure to journal the projects and tasks you complete so you can add them to your resume and LinkedIn. Something I try to do when on the internship hunt as well as during my internship is to get coffee with someone that is working on a project (or completed an internship) you’re interested in. It’s a great way to network and you may find out some insider tips. Back in February Mads and Katie started their tech podcast, The Cheddar. Why did they decide to press record? They saw a lack of female tech role models. After participating in their first hackathon at university, they saw a need to break down the “intimidation factor” of tech and allow women (and minorities) to be a part of the conversation. On a mission to create such a community, they established their podcast to discuss feminism, equal pay, recognizing women in tech, gender-specific toys, and more. The Cheddar is Katie and Mads’ way of conducting research, interviewing women in the field, and spreading girl love. Read on to see why the moved into the tech space and how they’ve found success.